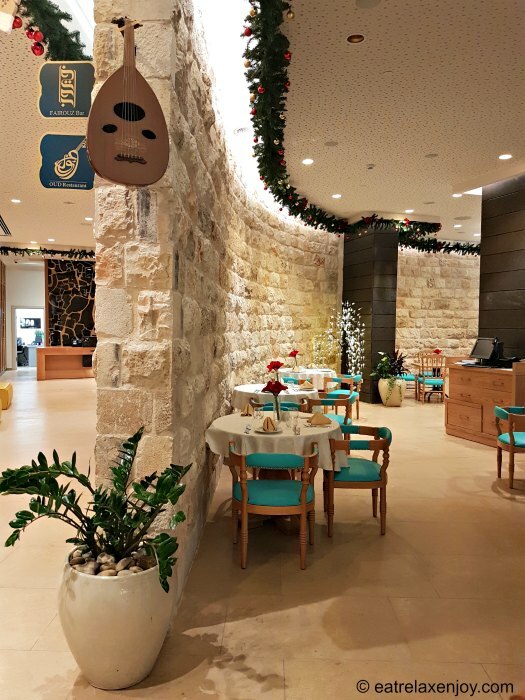 Oud Restaurant Nazareth is an Arab fusion Chef Restaurant in Nazareth located at the new Legacy Hotel. 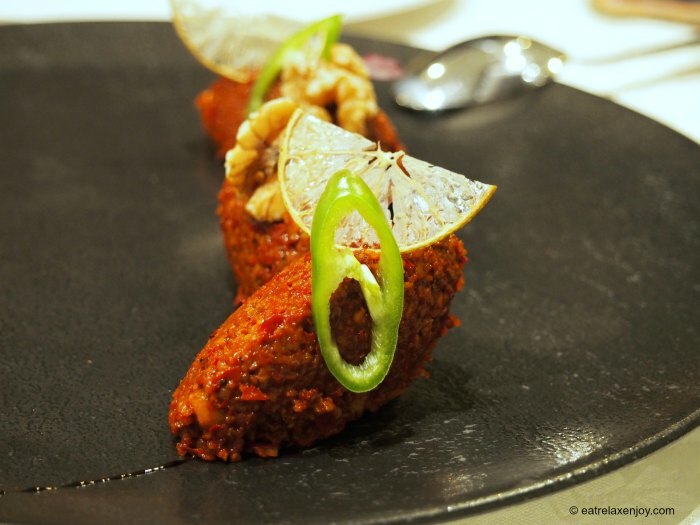 Chef Johny Goric brings together Arab and Middle Eastern flavors and turns them into elegant up-to-date cuisine. Oud is an ancient Middle Eastern musical instrument. 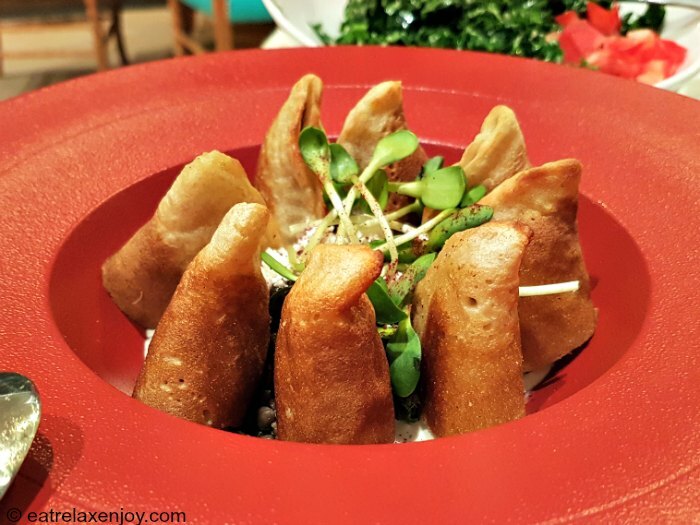 The restaurant that was named after it, combines Eastern and modern flavors. When you go into the Legacy hotel, look up, right at the entrance to Oud Restaurant you’ll see an Oud hung on the wall. Oud Restaurant is small and calm, but can accommodate a small family or group. Its décor is similar to the Legacy hotel’s décor – Jerusalem stone brick wall, touch of cyan, and a chandelier in the shape of the Flower of Life. The restaurant is facing the hotel’s terrace. I recommend reading also about the hotel and its décor. 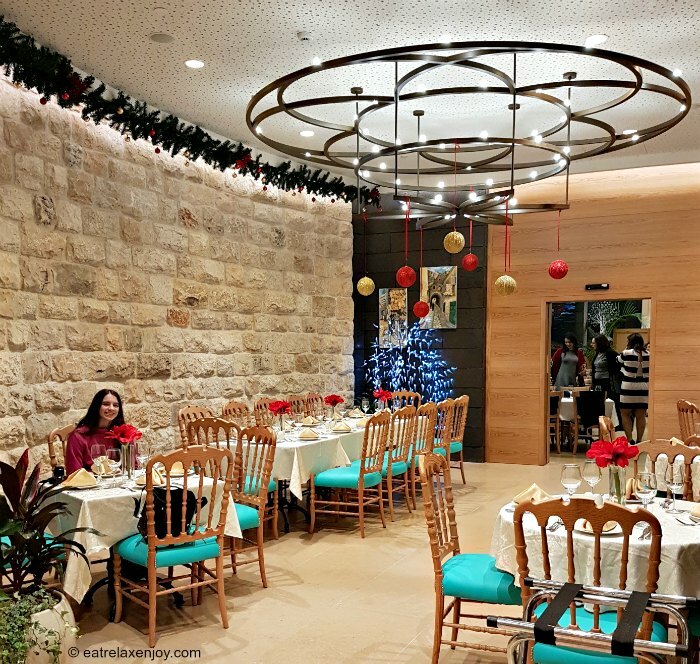 When we arrived at Oud Restaurant Nazareth on a Friday evening in December. The restaurant was nicely ‘dressed’ with white maps and cloth napkins. The restaurant was already decorated for Christmas like the rest of the hotel, and red flowers have been placed on the tables. We started the meal with salads, a common way to start an Arab meal. The salads were Hummus, Baba Ganoush, Fattoush salad, and Tabbouleh salad. I was told that they make everything fresh here, including the Hummus. Oud’s Hummus is excellent! So were the other salads. Nazareth is the city of Hummus. 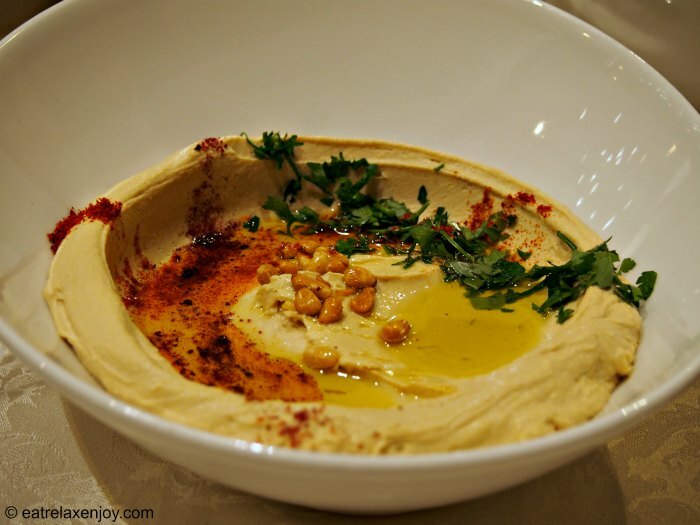 The best Hummus in the world is found in Nazareth, and Oud proves this. A must-order plate at the restaurant! Baba Ganoush is a salad made of roasted eggplant. The secret in it is to strain it well so that the bitter juice will be removed. Oud’s Baba Ganoush is made perfectly and one can feel the gentle taste of the eggplant that is served with chives and a garnish of vegetables. This salad was made of Cherry Tomatoes, Cucumbers, herbs and toasted bread pieces (I can’t remember by now but it is possible that it also contained yellow bell peppers). The salad is really tasty, refreshing and crunchy. Much more interesting than plain vegetable salad. 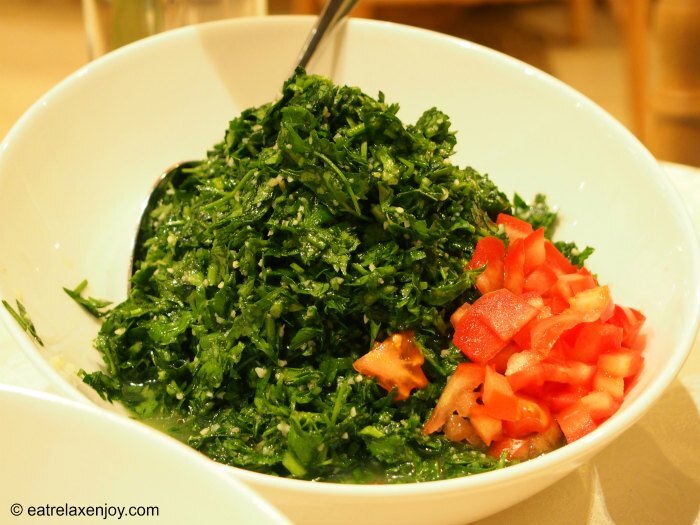 Tabbouleh is a salad made mostly of chopped parsley, tomatoes, burghul, and seasoning. This Tabbouleh was outstanding. The tomatoes were served near the parsley and not mixed, and the amount of burghul was small and did not take over the salad. The seasoning was very gentle and the mint was hardly sensed, which makes it much more suitable to the International taste. We had three appetizers. Two warm appetizers and one cold. Kataif dough stuffed with beef, served with lentils salad, Tahini, and Dried Labneh cheese. Kataif is pancake-like traditional dough used for desserts. The use of Kataif dough for savory food is quite unique and very successful. Although you need to eat it quickly, as it is best warm, the dough is wonderfully soft and yummy! 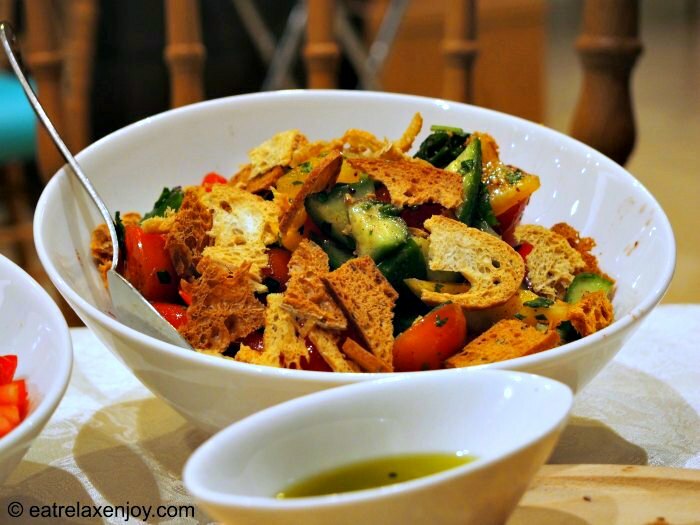 The filling is very tasty and I enjoyed dipping it in the Tahini, great match! The presentation of this plate was very appealing as well! A must-order here! 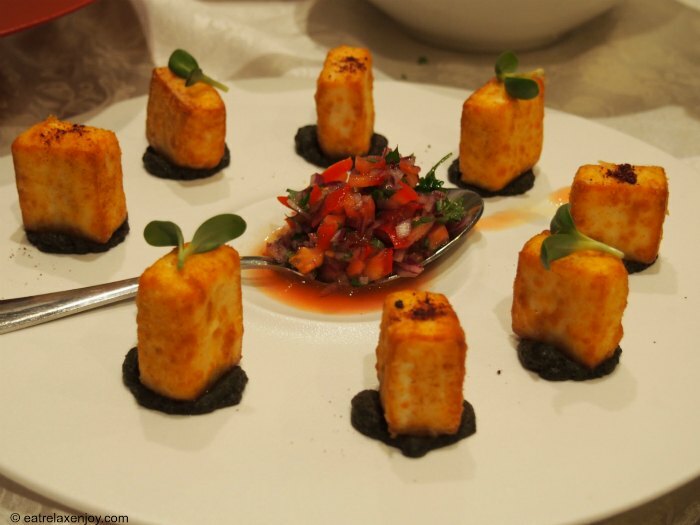 An especially beautiful plate of bricks of fried cheese, each lying on eggplant paste, organized on the plate in the shape of a clock, with a spoon of tomato-purple onion-herbs salad. While the cheese is a bit salty, this plate is a celebration! A cold plate of Burghul with tomatoes and spices (a bit spicy). Very nicely presented, although less my cup of tea, also because it is spicy. Boneless Salmon steak with herbs (parsley, dill, and garlic) sauce with vegetables served on fried beetroot Gnocchi, mushrooms. 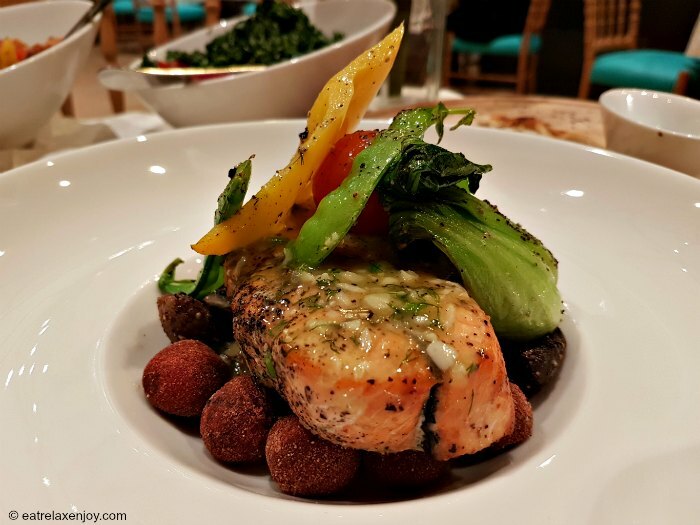 The salmon was perfectly cooked and was very pink and soft yet cooked well, the herbs blended well; although I’m not a fan of gravy (the sauce had a think texture of gravy, although transparent). 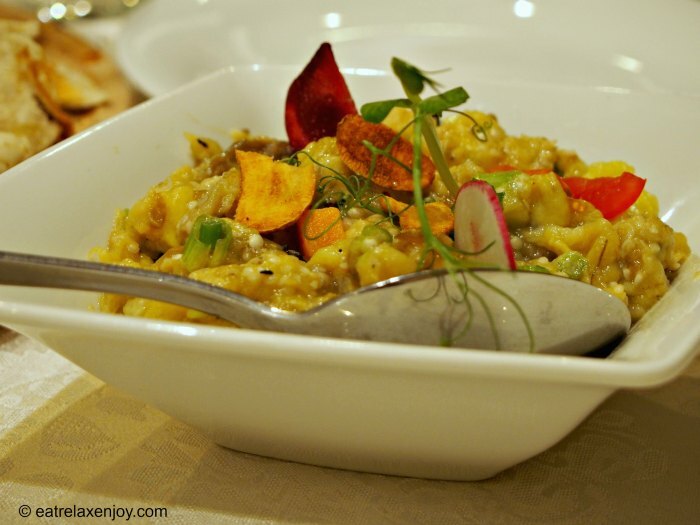 The Gnocchi was a real treat – crunchy from the outside, beet red inside – fantastic! The vegetables and mushrooms were nicely yet gently seasoned. Overall, this entrée is very gently seasoned and is a good choice for someone like me, who is not a big fan of Eastern seasoning. 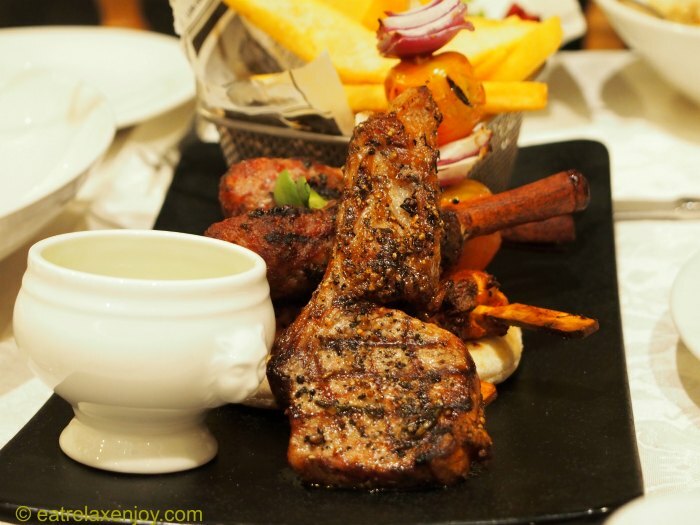 A mix of meats from the grill, including a small boned steak, 2 kebabs on cinnamon sticks, and a chicken skewer, served with vegetable skewer, steak fries and green Tahini. This Middle Eastern dish is also served nicely. My daughter especially enjoyed the kebab and the chicken skewer, but by the time she got to the steak it was a bit dry (also because it took us a while to photograph it before we started eating), it is a good idea to ask for it made to order. 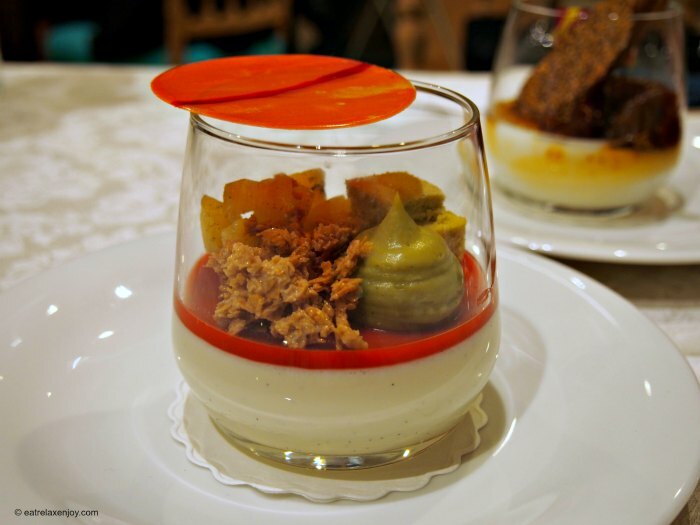 Desserts were served to us in cups – Malabi and Crème with toppings. 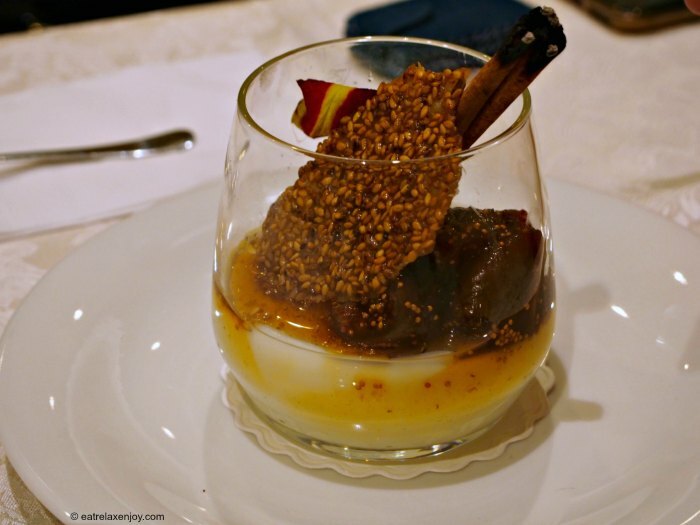 Crème with Figs – this is made without the crunchy top, served with figs Confiture and Sesame Tuile. A really tasty vanilla pudding with an interesting combination of figs confiture, a local treat. The sesame tuile was a bit overcooked to my taste, but still good to eat. Malabi – Malabi served with a rose glacage, pistachio mousse, caramelized white chocolate and pineapple covered with a red colored white chocolate disc. This dessert looks like an aquarium full of goodies, an extraordinarily stunning dessert! Oud Restaurant Nazareth serves a variety of food including meat, chicken, fish and seafood. The service at Oud Restaurant Nazareth was excellent. The waiters are especially courteous and it is evident that they were professionally trained also how to serve according to the ‘rules’. After the main course, we were served a warm napkin, and the cutlery was replaced as well. The combination of a pleasant restaurant, excellent service and good food makes the restaurant a good choice with interesting modern Arabic cuisine! I also recommend the Legacy hotel if you need accommodation, a Tour of Nazareth, and shopping. Information: Oud Restaurant Nazareth, Legacy Hotel, Paulus street, Nazareth.